In this crackling fiction debut, Marc Blatte casts a cool eye on the gritty streets of New York City, and spins a mystery that is, in the words of "Law & Order" Executive Producer Fred Berner, as "elegantly twisted and satisfying as the best crime novels." Ride shotgun with Detective Black Sallie Blue Eyes on his quest to solve a murder at a downtown hip-hop club, and encounter a host of characters that run the gamut of NYC high and lowlife society from the projects of Far Rockaway to the mansions and manicured lawns of Westchester and the Hamptons--rapstar wannabes, hipster tweakers, Wittgenstein-spouting impresarios, fetishists, billionaires, and one Eastern European refugee dead-set on revenge old-school style. "Marc Blatte writes like a freight train on fire. 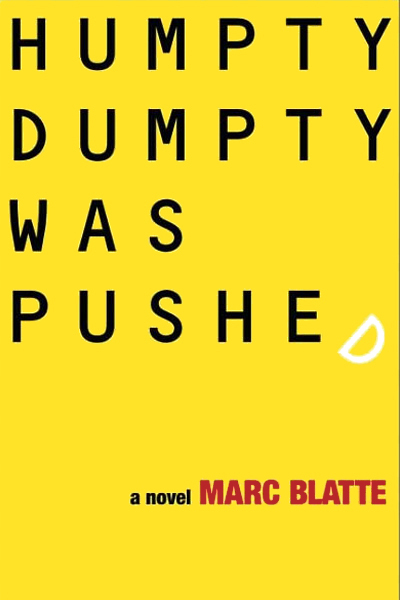 Humpty Dumpty Was Pushed is a page-turner that serves up plot as elegantly twisted and satisfying as the best urban crime novels. But the real hero of Blatte's writing is his gift for character. His affecti"
"I flew through it immediately ... What fun! Blatte may have written the first truly wonderful hip-hop noir. The Albanian Kosovar characters come alive with lively originality and their notion of race and big money in the US is brilliantly rendered. It's h"
"Marc Blatte puts his street cred on the line with this hugely entertaining, rollercoaster ride through New York's most dangerous, most colorful precincts. His bouncers, police detectives, and hip-hop musicians are unforgettable men and women who collide, "
"A dark, witty, and often brilliant novel. Humpty Dumpty Was Pushed is such shocking good fun, you won't feel guilty about laughing at all the carnage."